Portland, OR. 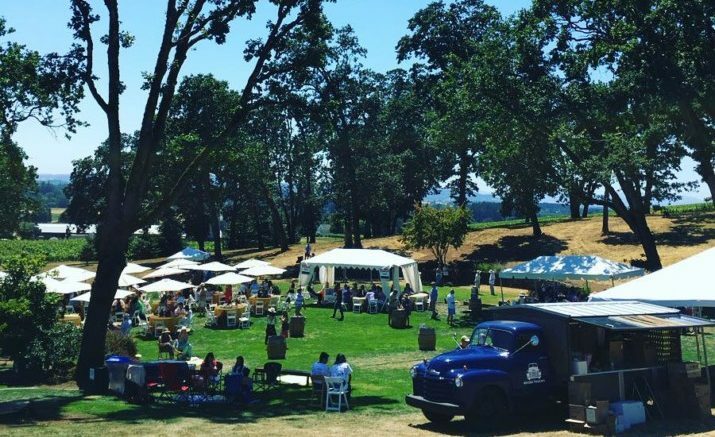 The inaugural​ ​Oregon Croquet Classic​, presented by Classic Wines Auction, took place at Stoller Family Estate on July 21st and raised nearly $38,000. Net proceeds will benefit five local nonprofits: ​Metropolitan Family Service​, ​YWCA Clark County,​ Friends of the Children​, ​New Avenues for Youth​ and ​Unity Center for Behavioral Health​. The object of the game is to hit your ball through the course of wickets in the right sequence and finish by hitting them against a centre peg. Classic Wines Auction and related events have raised more than $46 million for local nonprofits since the organization’s inception in 1982. Brian & Johnathan are social media influencers known as The Gay Beards. Mercedes-Benz of Portland was a sponsor. With more than 300 guests in attendance, the event included a BBQ lunch prepared by Stoller’s Executive Chef Becca Richards, live music by the Pete Krebs Trio and Jen Bernard, wine tastings by local wineries, and tasty treats from local purveyors. Guests also learned the finer points of croquet from local experts and played other games including bocce. Throughout the year, Classic Wines Auction hosts a number of events in support of its nonprofit partners, including seasonal Winemaker Dinners and urban tasting events. The 35t​h​ annual Classic Wines Auction will be held on March 2, 2019. Consistently r​ecognized as one of the top ten charity wine auctions in the country by ​Wine Spectator,​ theClassicWinesAuctionhasraisedmorethan$46millionforlocalnonprofit partners since its inception in 1982. ​Based in Portland, Ore., Classic Wines Auction, Inc. is a nonprofit organization dedicated to producing the Classic Wines Auction and related food and wine events to raise funds for local organizations benefiting children and families, including: Metropolitan Family Service (MFS), New Avenues for Youth, Friends of the Children-Portland, YWCA Clark County and Unity Center for Behavioral Health. The organization recently received – for the third consecutive year – a four star rating from Charity Navigator recognizing exemplary performance in accountability, transparency, as well as strong financial health. ​Mor​e at www.classicwinesauction.com​.